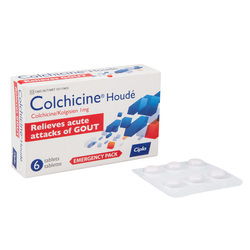 Colchicine is also well known as gout agent. Colchicine is useful as a form of treatment in acute case of gouty attack. Colchicine or NSAIDS are usually used together with allopurinol when the treatment with allopurinol is just begun. This is to avoid acute gouty attack which develop during the first few weeks of administration of allopurinol. Colchicine may carry its own side effects such as alopecia, suppression of the bone marrow and gastrointestinal discomfort. Colchicine acts by blocking the formation of leukotriene B4 and decreasing the migration of the leukocytes to the affected sides by binding to the tubulin which may lead to induction of microtubular depolymerization.